'ACANA Senior features an unmatched variety of local ingredients that are raised or fished by people we know and trust, deemed “fit for human consumption”, and then delivered to our award-winning kitchens fresh each day! Senior dogs are best fed a diet rich in meat proteins to support lean muscle mass, yet limited in carbohydrates which can lead to obesity and diabetes. 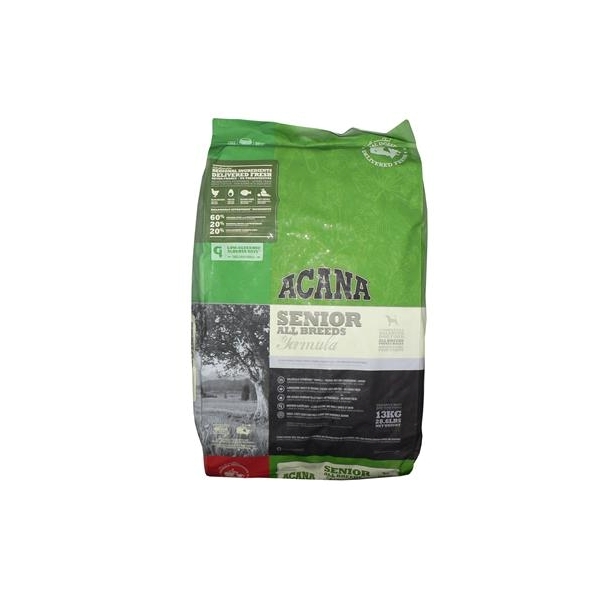 ACANA Senior features higher protein levels from richly nourishing free-run chicken, nest-laid eggs and whole wild-caught flounder that are delivered to our kitchens fresh from our region so they’re loaded with goodness and taste. Fresh chicken meat (16%), chicken meal (15%), turkey meal (14%), red lentils, whole green peas, fresh chicken giblets (liver, heart, kidney) (4%), herring meal (4%), pea fiber, fresh whole eggs (4%), fresh whole flounder (4%), herring oil (2%), sun-cured alfalfa (2%), field beans (2%), green lentils, whole yellow peas, chicken fat (1%), chicken cartilage (1%), dried brown kelp, fresh whole pumpkin, fresh whole butternut squash, fresh whole parsnips, fresh kale, fresh spinach, fresh mustard greens, fresh turnip greens, fresh whole carrots, fresh red delicious apples, fresh Bartlett pears, freeze-dried chicken liver, freeze-dried turkey liver, fresh whole cranberries, fresh whole blueberries, chicory root, turmeric, milk thistle, burdock root, lavender, marshmallow root, rose hips.